Join the #GCPLogo summertime contest and win fame, glory, and prizes! 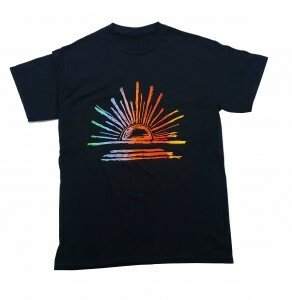 Just post a snapshot of the GCP t-shirt or hat to the God’s Child Project Facebook page and include #GCPLogo. Become instantly eligible to win Scheels, Target, and Starbucks gift cards in the categories of Most Fun, Most Unique Location, and Most Heartwarming. In celebration of GCP’s new Celebrating Summer 2018 logo, designed by Milwaukee-based art therapist, Neto Atkinson, we want to see YOU wearing our new apparel. 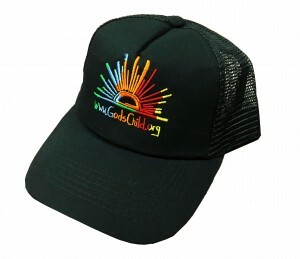 Just send your snapshot of the GCP t-shirt or hat to Info@GodsChild.org, or post it on your FB page and include #GCPLogo. Become instantly eligible to win Scheels, Target, and Starbucks gift cards in the categories of Most Fun, Most Unique Location, and Most Heartwarming. Buy Your T-Shirt or Hat Today! Just post a snapshot of the GCP t-shirt or hat to the God’s Child Project Facebook page and include #GCPLogo, or email it to Info@GodsChild.org. These shirts are being sold with a special discount for a limited time! Enter the promo code #GCPLogo at checkout for 25% off on your new t-shirt or hat! There are great prizes for the winners with the best photos! This contests ends on Labor Day, so hurry and get your new t-shirt or hat today! Tell your friends and encourage them to join the contest!